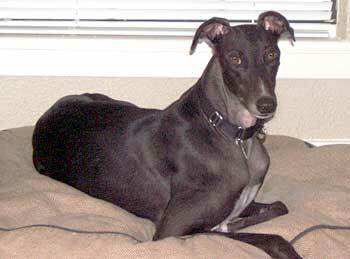 Kayla, aka Pals Batwoman, is a two-year-old black female, born August 13, 2005. Her sire is Flying Penske and her dam is Earthsuit. 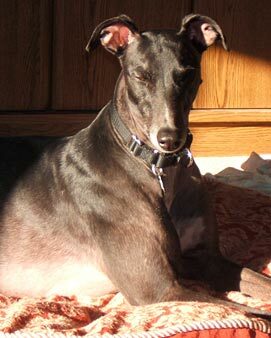 Kayla is named after her grand-dam, DP's Kayla Marie, a female out of Wigwam Wag. 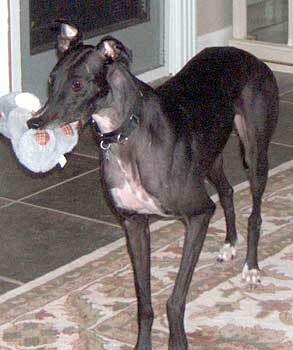 GALT received a phone call from TGA (Texas Greyhound Association) asking if we could help this little girl. 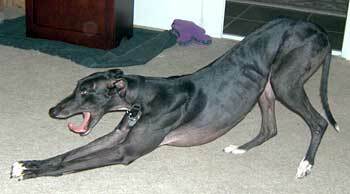 She had been on a haul from Gulf Greyhound Park and got loose. She was recovered but not before she was traumatized and injured. Kayla had many open wounds, but is all healed now. 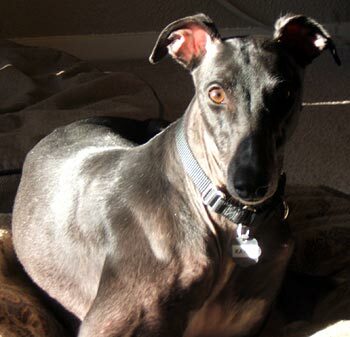 She is a petite greyhound, who at this time is scared of her own shadow – for good reason. It is not known at this time if Kayla is small animal or cat tolerant. Kayla is a very petite little girl who doesn't trust easily. We have no idea what caused her to be so afraid and scared of the world, but she is definitely untrusting of people. I am working diligently with her morning and night to earn her trust, but it is a game of patience and understanding. As of Thanksgiving, she's been at my home for about six weeks and only in the past couple of weeks did she want to come to me on her own to take chicken from my hand. This is still at a full arms length, but a big step nonetheless. She is doing this more consistently now, but she is still very concerned about staying far enough away to run for safety. One of the highlights for Kayla is that she loves her foster brother and sisters and shows a little more confidence with them around. She's also discovered stuffed toys and she has such fun playing with them she forgets to be scared (until she sees you watching her). She enjoys her food and she is eating well. I work with her morning and night by sitting on the floor with her and petting her all over, rubbing her feet, talking softly, and she really likes a gentle ear rub. This is touch and go, but she does relax periodically with a big sigh...still, she is on full alert most of the time. 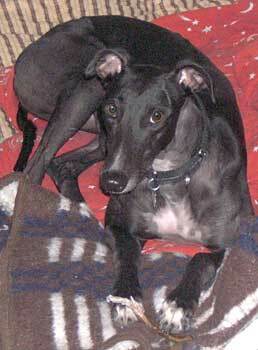 She loves being around other greys and would need to go to a home with other dogs. She approaches me more easily and with a little more confidence when the other greys are around, but still doesn't stay close for more than a second and then she moves away to a safe distance. A new foster came into my home a couple of weeks ago and now Kayla is showing signs of competition (which is good) and she is now vying for her share of attention with the other hounds around. Kayla wants very much to trust people, but it will take considerable patience and time to win her over. Under the circumstances she doesn't go to meet and greets yet and may not for some time – but you are welcome to come to my home to meet Kayla and visit with her. She deserves to have a patient, loving forever home and I'm confident with time she will continue to make progress with her people friends.